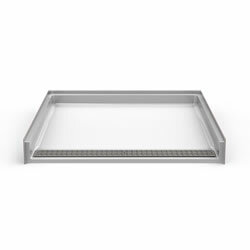 Bestbath Code Compliant Transfer Shower Pan: ADA/ANSI A, ANSI B, California Title 24. Transfer shower pan with 1″ threshold, 2% slope, Front Trench drain, and magnetic grate attachment. W x D x H (Outside Dimensions): 45" x 50"